This maintenance kit includes one PrinterTechs compatible fuser, 1 transfer roller, 4 feed/separation rollers, 1 manual feed tray pickup roller, and *bonus* : 1 manual feed tray separation pad, and 8 D-shaped pickup rollers -- these parts are not found in the kits sold by HP and most of our competitors. For use in the HP LaserJet 4100 and 4101 series. 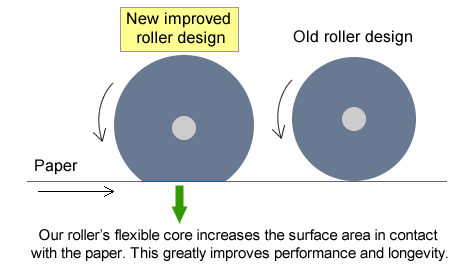 PrinterTechs Laserjet 4100 premium feed rollers have a flexible core. This provides better paper grip and greatly improved longevity. Approximately 2.5 times the grip of standard feed rollers!